Die-hard movie fans like to wear their hearts on their sleeves, and now, fans of classics like Friday the 13th, The Thing and more, can do so, quite literally. 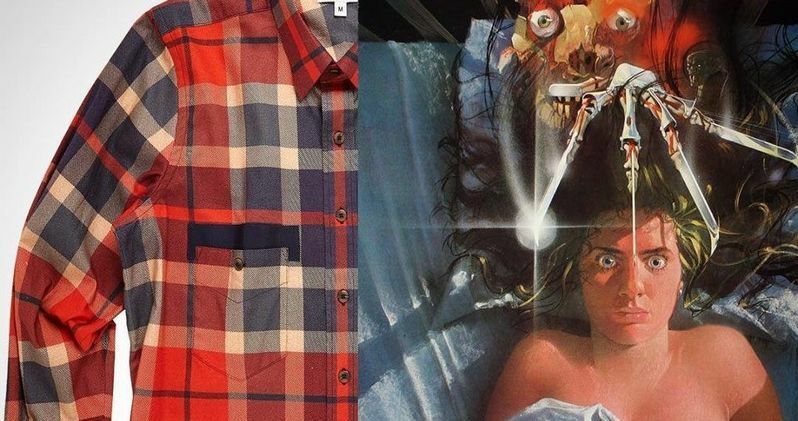 A clothing company entitled JC-RT, which specializes in making tailored flannel shirts, has revealed a new collection of custom shirts that are based on the color schemes of classic movie posters such as A Nightmare on Elm Street, Alien, and The Lost Boys. We have photos of several of these shirts that show how closely they match up to the corresponding movie poster below. The JC-RT collection based on horror movie posters kicked off with The Exorcist, Friday the 13th and A Nightmare on Elm Street, and while the company's website doesn't have any photos that match the shirt with each movie poster, any fan of those movies can see how accurate their designs are. The collection also includes Blade Runner, The Thing, Time Bandits, Alien, My Own Private Idaho, The Lost Boys, Full Metal Jacket and Lost Highway. Most of these shirts are currently on sale at $75, marked down from an MSRP of $125, but the Friday the 13th and A Nightmare on Elm Street shirts are currently $90. You should really make Freddy and Jason proud and invest now. If you love books, music and video games just as much as you love movies, then you're in luck as well. The company is currently selling custom plaid shirts based on iconic albums like Nirvana's Incesticide, Siouxsie and the Banshees' Kaleidoscope, Bjork's Debut, Sinead O'Connor's The Lion and the Cobra and De La Soul's Three Feet High and Rising. The company also collaborated with One Grand Books and BlackBarn's Chelsea Market space, who selected five classic books for the company to create plaids from. Tilda Swinton's selection was Modern Nature by Derek Jarman, Michael Stipe's selection was Just Kids by Patti Smith, James Franco's selection was Blood Meridian by Cormac McCarthy, Trevor Noah's selection was The Little Prince by Antoine de Saint-Exupéry and Ta-Nehisi Coates's selection The Great Gatsby by F.Scott Fitzgerald. The company's video game collection includes arcade classics like Dig-Dug and more recent hits like Portal, the latter of which could be a big hit if the movie adaptation of Portal from J.J. Abrams' Bad Robot finally comes to fruition. Other video game shirts include The Legend of the Princess, Bioshock, Fallout, Mother 2, Super Bros and Final Fantasy 3. There is also a separate collection of book-inspired plaids for 1984, One Flew Over the Cuckoo's Nest, The Bell Jar, The Stand and the rock group The Echo and the Bunnyman. It remains to be see what future collections this eccentric company has in store for pop culture fans. Fans will also find plaid shirts inspired by the Playskool toys, stars of yesteryear such as Spencer Tracy, Cary Grant and director Orson Welles, along with several plaid shirts that aren't inspired by anything in pop culture at all. They're just, you know, plaid shirts. You can take a look at some of the photos of the movie-inspired plaids below, and if you want to place an order, or check out the rest of the collection, you can do so at JC-RT.com, where you can also pick up any number of plaid accessories like ties, pajamas and much more.